This series of three articles grew out of research I did at the request of Mark MacRae for historical articles for the Clipper. This article, Part One, gives a history of the first 105 years of women at QCYC. Part Two will offer profiles of our three women commodores and other women who, without holding the highest office, made especially notable contributions to the Club. Part Three will tell the story of the Women Skippers Race. It is fitting to examine the history of women at QCYC this year as it marks the centenary of female suffrage in Canada. I owe an immense debt to Wayne Lilley and his researchers for Queen City Yacht Club, 1889-1989. The first hundred years of this article is based on his book. Further information is drawn from Club rosters and Clippers, supplemented by interviews and personal correspondence. It is important to put women’s history at QCYC in the context of the evolution of women’s rights in Canada. Women could not own property in Upper Canada (Ontario) until 1859, they could not vote until 1918, and they were not considered “persons” until 1929. In 1889 when QCYC was founded, sailing was a man’s sport. In the 1890s when the Club occupied a couple of boat houses on Clindining Row, women could not become members and were not encouraged to visit. Though they might be permitted to use the Board Room, the only facilities offered were a mirror and hooks for wraps. In 1902, however, the Club built a beautiful new clubhouse at the bottom of York Street (approximately where the Gardiner expressway is now, infill has moved the shore line south) and ladies could be introduced by members and could use the Club balcony–but only on Saturdays and race days. A water supply tank and a used stove were installed in the women’s washroom. The photo on the previous page shows women on the balcony at QCYC circa 1910. Smokers—parties where men smoked cigars and pipes and chewed tobacco–were very popular at the Club. In 1903 the Smoking Concert Chair donated the year-end $45 surplus (approximately $1,000 in today’s money) to renovate the ladies’ parlour. The layout of the second floor of the 1902 clubhouse shows the location of ladies’ room and washroom. It did not last. In a letter to the Entertainment Chair in 1907, the Secretary-Treasurer stated, “I am also instructed to advise you that ladies’ privileges are discontinued from this date and ask that you instruct the steward accordingly so that the Ladies’ Room can be put at the disposal of the members for a sitting room.” Although several trophies had the names of women on them by 1909, they had lost the privilege of using the members’ balcony and a year later a member had to be reminded that introducing a lady in the Club was prohibited between October and May. There was one exception. Iceboating was so popular at QCYC that the Club permitted women to use the Ladies’ Room in winter on iceboating days. clubhouse sank and was replaced by a new one on what is now Algonquin Island. In 1921, the Acting Treasurer, Richard Slee (my greatgrandfather), promoting membership, described the new clubhouse as follows: “The assembly room has a floor space 32 x 67 feet for reception and dancing, with a balcony extending the full length, including ladies’ room, washrooms and shower baths.” This is our current clubhouse. In 1923, women were finally allowed to join as lady members. The bylaw read, "lady members shall have all the privileges of the Club House and may be appointed to any of the committees, but shall not be entitled to be elected as Directors, or take any part in the control or direction of the Club, serve only as members of such committees, or vote at any meetings of members and it shall not be necessary to give them notice of any meetings at the club." They paid only $5 for these “privileges” instead of the $15 senior member rate. This was a purely social membership. But the same persistent Miss Burt who had enquired about membership in 1918 actually wanted to sail; she applied once more for berthing space in 1926, and this time was advised to circumvent the constitution by reapplying but using her brother's name. In the early 1950s for the first time, women could moor and sail boats at QCYC. There was definitely resistance to the revival of the lady member category, not only by most male members but also by some of their wives. But the sisters Naomi and Vivienne Trudeau, who had been around the Club for some time, were encouraged and supported by several influential members, Blake Van Winckle, Ray Lye, and Al Rae Senior among them. They were accepted as QCYC's first two female members of that era, and a worthy addition to QCYC they were. At first sailing the Snipe Jay, they placed third in points and won the Club’s Sportsmanship Trophy. The third female member at that time was Karin Larson, who in 1957 started the magazine GAM, which has since become an institution. She was nominated by Mal Harris, who also helped her buy her first boat, the Comet Quill. Though women could still not vote, this was a significant step forward in the move towards equality of the sexes at the Club. Not all the women sailors felt quite at home at QCYC, however. Island resident Anne-Lise de Haas remembers keeping her boat at the Club but sailing it only during the week because she felt out of place when the men were around on the weekend. In 1969, after much discussion, the Board allowed women to join as senior members, but only as nonvoting ones. They were not allowed to build boats in the yard. Still, with this initiative, women were integrated a little more formally into the Club. And this was reinforced a year later when the Club dealt with its first pay equity issue. Junior Club instructor Alex McLaughlin appealed her $35 salary on grounds that her fellow instructor John Bleasby got $15 more though her qualifications were exactly the same. The Board, to its credit, agreed. By 1975 the Club started to emerge from the dark ages when the only two female senior members at the time, Grace Pincoe and Rivanne Sandler, became the first women to vote as senior members. Finally, in 1979 women could become Board members. Jean Grice was elected publicity chairman, thus becoming QCYC’s first female officer—the only one until 1991. 7) to clarify survivorship rights. At the Annual General Meeting on December 6, 1990, the section of the bylaws on Senior Members was changed to define a Senior Member as potentially including a spouse (a unit membership in which either spouse could hold office and vote but only one could hold office at time and they were entitled to cast one vote jointly). This was a major game changer. Women began to be elected to the Board. The next woman officer, Lynda Chubak, Chair of Membership, was elected in 1991 (the year after she was accepted for Senior Membership) and was joined by Moira Coull in 1992 as Junior Club Chair. Moira went to become our first woman Commodore. when women had a much lower profile. It's great to see women more involved and enjoying the Club to a fuller extent!” In recent years an average of four to five members out of 15 Board members have been women. Not to leave out younger women, Carrie Noak and Debbie Fogh advanced to the Canadian National Team for 1995 in 470 Class and aimed for the Canadian Olympic team for 1996. Secretary Sari Bercovitch led the Club to raise $5,000 for Carrie and Debbie’s Olympic challenge. In 1996 however, after a hard-fought race, Carrie and Debbie placed fourth in the Olympic trials in Vancouver and would not represent Canada at the Olympics. 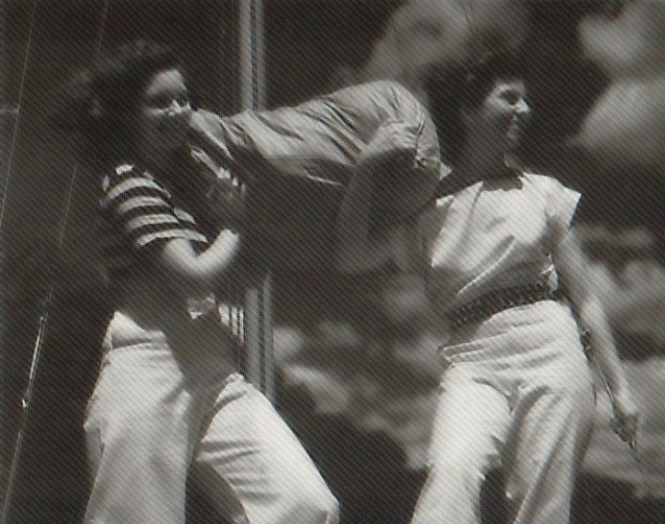 Part II on our Women Commodores and other important women contributors to the Club to follow.